Glow getter – it’s the millennial turn of phrase to describe individuals seeking to achieve a gorgeous, natural (looking) and healthy radiance. Sought by many and achieved by the few, the elusive “glow” can be tricky to execute. I know, it seems all kinds of wrong to be writing about achieving a natural looking glow when small talk at the hairdressers has already turned to Christmas shopping, but healthy looking skin is always in season and the reality is that in the colder months it’s even harder to achieve. In all honesty, if you’ve read my blog for a while then you’ll know that I’m actually inwardly squealing. Autumn is my favourite. Pumpkin Spiced Lattes have been my jam long before they became worthy of a square on an Instagram feed. The combination of warm drinks and darker evenings, cold yet sunny days, just makes me want to snuggle in a little sun trap and indulge in a good read (or TED talk – right now I’m heavily into TED talks, so if you’ve got any recommendations on great ones, help a girl out and tell me about it 👇🏻😽). With all that said, I still want healthy looking “glowing” skin everyday. In years gone by I’ve embraced my complexion, the fact that I’m often so pale I could easily be mistaken for a distant member of The Aadams Family. Since then I’ve learnt that pale doesn’t need to equal dull. A glow has nothing to do with having a tan and everything about exuding health and radiance. I’ve given my makeup an overhaul following this little epiphany. I’m imagining some of you guys may feel you need to do the same? That is why I’ve curated a list of the best products around to achieve a glowing complexion with options to suit most budgets. All tried, tested and adored by yours truly. Retinol Ceramide Capsules from Elizabeth Arden (£42 for 30 capsules or £72 for 60 capsules). Yes, these are pricey but the effects speak for themselves, to describe the effects of this product would be a blog post in itself. Tiny, yet powerful these capsules (used nightly) have dramatically smoothed my skins texture and eradicated my enlarged pores. As a result, I can wear far less makeup and you know what they say about less and more! Please note the capsules pictured were a weeks supply, kindly gifted to me – my opinions are completely my own. Facial massage is one of the most underrated beauty tools available to all. Somehow, due to some ridiculously photogenic, semi-precious stone rollers available this practice is easily mistaken for yet another beauty fad. Trust me, this could not be farther from the truth, the benefits of facial massage are pretty limitless – stress reduction, improved circulation, reduction of puffiness and even a more radiant glow. I use The Body Shop facial massage tool (£16) and massage in upward motions nightly after applying my night serum. I spend a few minutes doing this instead of scrolling my phone and I even sleep better too. PUR glow and illuminate primer (£24 via UK stockists Marks and Spencer) this creates a warm and subtle glow when worn under light coverage foundation. The kind of glow that before trying this, I thought you could only achieve by selecting the right VSCO preset or ‘gram filter. George Illuminating Primer (£5.50 ASDA) is an amazing dupe for the PUR primer I just mentioned, slightly less luxurious in consistency and not as long wearing. That said, it’s cheaper than a large latte and a toasted tea cake so as far as bang for your buck goes…. Hands down, the best on the Highstreet that I’ve tried and probably around half the price. If you’re anything like me, I know you’ll be thinking of all the shoes (or Nandos) you could buy with that saving over the year. 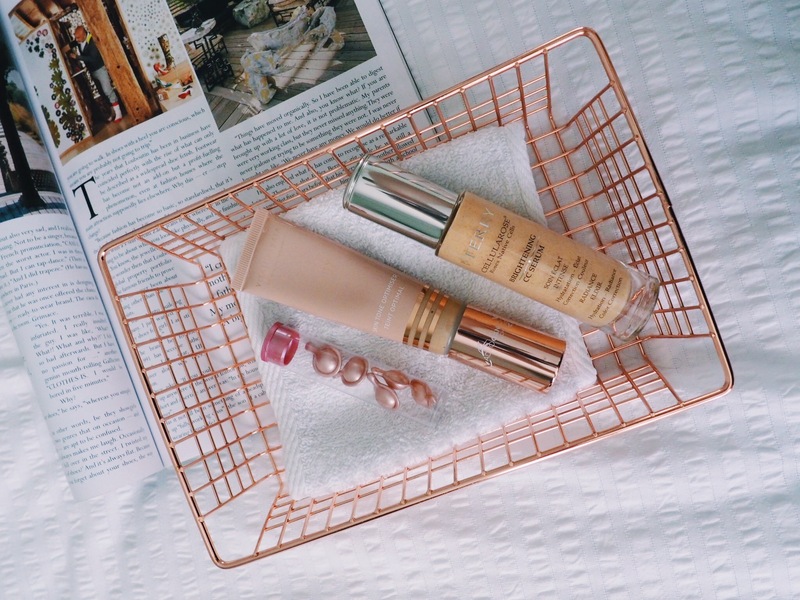 Another favourite is the Stay all day 10 in 1 HD illuminating beauty balm with SPF 30 (£28 Stila) with a list of benefits as long as it’s name, this is radiance in a tube that packs some serious punch. Personally, I opt for this when my skin needs some extra tlc. My period tends to make my skin more prone to irritation and also excessive oil production and this helps combat both these issues. If, like me, sometimes you struggle to find time in the mornings. The kind of mad rush where you have to make a choice to brush your teeth or your hair (I hope it goes without saying which one always wins!?) then you need a makeup that does it all. Look. No. Further. The Beauty Blur Skintone Optimizer (£29.95) from Vita Liberata delivers. Flawless complexion? Absolutely. Radiant Glow? Err, sunglasses please. By Terry Cellularose CC serum (£43-£61 at various UK stockists) I use shade Apricot Glow and I love it for its cell renewing properties. My skin looks better in the evenings after wearing this all day than it does in the mornings prior to application. Worn under foundation or as a stand alone base this product is truly beautiful. The consistency is a very thin serum, completely non-sticky that melts into the skin leaving the most subtle glow. The easiest way to achieve “no makeup, makeup”. Vita Liberata Body Blur HD skin finish (£29.95) A little of this on the décolleté goes a long way. Natural extracts have an anti-aging effect on the skin and the light reflecting particles really deliver the most exquisite glow. Worn on the legs this is as good as airbrushing, as it says on the company website, it’s like wearing a light pair of stockings everywhere. Sadly this does transfer so wear with caution when wearing light clothing. A great, more purse friendly product that delivers similar results is the Rosie for Autograph Amazing Radiance Body Glow (£12.50). PS. Happy Autumn, what’s your favourite season and why?